OnePlus announced a great offer for music and movie lovers. 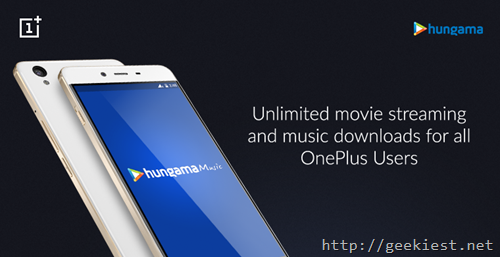 Now you can get unlimited movie streaming and music downloads from Hungama worth Rs. 3,599 for Free. that is a a FREE 90 days subscription of the service. The Company says it is for the OnePlus owners but we don’t know how they will restrict it. As of now they are just asking which OnePlus device are you using and a radio button to choose one from the list, so even if you do not own a OnePlus device give it a try. Visit this link and fill the form with the details asked. You will receive a promo code (We must say that even after 12 hours we have not received it), do note that the PROMO code can be used only once by a user and should be used before December 31, 2016. You need to install Hungama Music - Songs & Videos (more than 3 million songs and music videos)for the Music and Hungama Play Online Movies App (More than 6000 movies available in this application) for the Movies.